A Sandy Path Book Reviews: A lovely, little book! 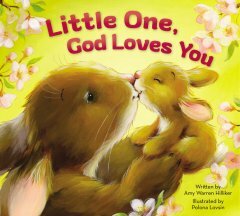 Little One, God Loves You by Amy Warren Hilliker is just the right size and length of reading for a young child. It is listed for ages 4 and under but I have grandchildren in ages from under a year to 10 years old and I think it will best fit ages 2 and under. It is so adorable and sweet, it will be a cute read at any young age! The illustrations from front cover to back are absolutely beautiful. There are short and single sentence per every page or so and this is ideal for the kind of book it is. Giving children God's message of love cannot start too soon and this is a great help in that direction. I think it would also a dear and lovely gift on it's own or tucked into an Easter bag or child-themed gift basket! I received this book free of charge from Book Look Loggers in exchange for an honest review.